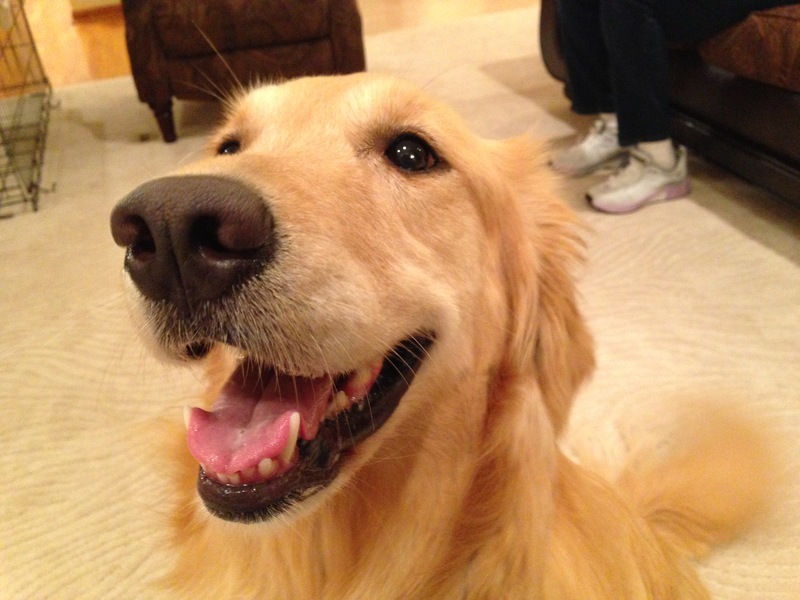 This happy gal is Soni, a a three and a half year old golden retriever who rushes the door when guests arrive, jumps on people, barks outside, gets distracted and pulls on walks and needed help with basic commands. Knowing she liked to jump up on guests when they arrived, I took an assertive posture and did not let her circle around behind me. At first Soni was content to sniff, but after a bit of that, she started to jump so I made a sound to disagree with the action. This stopped Soni from jumping up on me any further, but I showed their guardians another technique to apply when she jumps in the future. 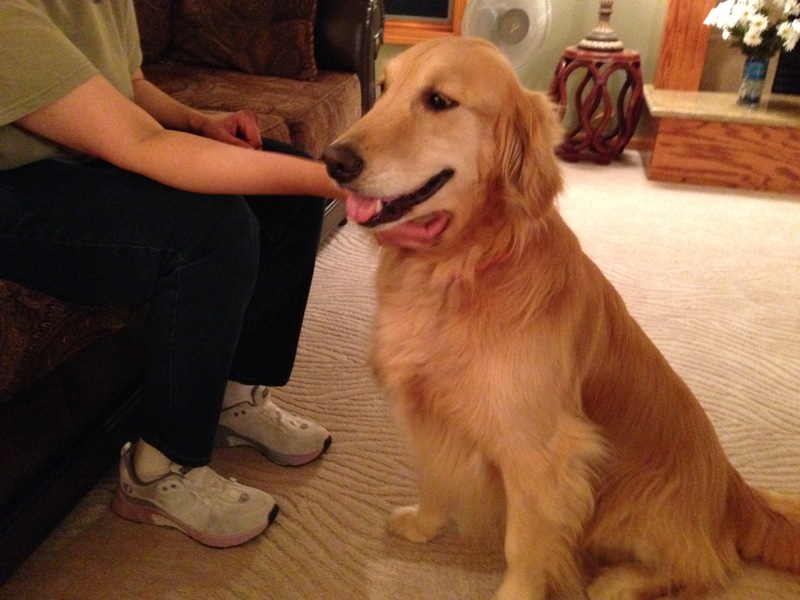 When I sat down with her family to discuss the situation, I noticed that the dog repeatedly invaded her guardian’s personal space when she wanted attention. It was easy to see why, each time she did, they reached over and petted her. This lack of respect for their personal space was an indicator of a bigger problem, but still something that needed to be addressed. I consider petting a dog as “paying” it and when I’m working with a dog that has issues I make an effort to only pet it when it engages in actions or behaviors I condone. But in this case, Soni was essentially giving her guardians an order or telling them what to do; “pet me!” This is the bigger problem I lauded to earlier Soni thought of herself in a leadership position amongst the members of the family. To stop the behavior and change how the dog sees itself in terms of authority, I suggested that the members of the family start defining their personal space and stop petting her when she nudged, barked or pawed at them for attention. To stop the dog from constantly jumping up on or leaning against them, I had them make a sound to disagree with her when she was approaching but still a few feet away. We need to communicate the boundary we want the dog to respect and disagreeing with a dog the second it crosses this boundary is how we establish it. Now because this has been going on a while, its common of the humans to forget to define their space and end up with a dog leaning, nudging or pawing at them for attention. But instead of petting the dog when it does this, I suggested that they give her a counter order of “sit.” Then once the dog sits, to reach over and pet her under her chin while repeating the command word “sit” three or four times as they petted her. When a dog feels proud about themselves, they have their nose parallel to the ground or higher. Scratching a dog under the chin helps the dog adopt this posture as we want them to feel good about themselves when doing something we want to encourage. By only providing this attention and affection after the dog follows a command, we can use positive reinforcement to condition the dog to adopt a desired posture when it wants to ask for attention. This way Soni comes over and sits respectfully a few feet away front he human when she wants to ask for a scratch behind her ears. Next I went over a few exercises that will help Soni and her guardians interact in a way that reinforce the leader follower dynamic they want and get her owner re reluctance to go into the kennel. Two of the exercises went well and the other took longer for Soni to figure out. Just like people, somethings are easier than others. I suggested that their guardians practice the exercises that Soni did well in and then went over another version of the one she had difficulty with so that they can practice that later. Because she sometimes pulled or reacted to various stimuli (dogs, rabbits, squirrels, etc) on walks, I fitted her up with a Martingale collar and added my special twist to the leash. Before heading out I went over how to wait and get the dog to settle and calm itself down. When your dog is over excited before you leave the house, that is the same energy they will have on the walk. By taking the time for the dog to settle down before you leave, you will almost always have a much more enjoyable experience. Once outside I took the leash first and went over some leash basics and a few rules I like to use on structured walks. After demonstrating these to her primary guardian, I handed him the leash and off he went. He immediately commented on how much easier it was to get her to follow his lead and corrections. Within about 50 feet, she was walking right next to him at a almost perfect heel. 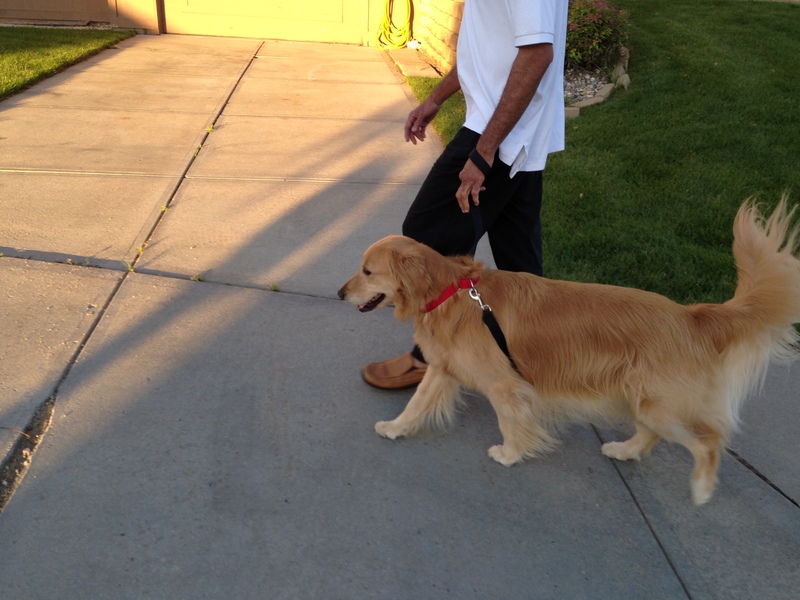 As we waled we ran into a few dogs and people who agreed to help us out. We practiced passing them and I showed her guardian the signs to look for that precede her from jumping, pulling or lunging after them. Recognizing these signs and correcting he dog before she started to react allowed her handler to get her to stop before she got started. After a few passes, Soni was ignoring these distractions on her own. By the time we wrapped up the session, her family commented on how much calmer and better behaved she was. It will take practice at the new exercises, consistent corrections when she forgets the new rules and boundaries and generous reinforcement of the actions and behaviors they want before they become the new norm. But based on how quickly the dog and her family picked up the new techniques, it shouldn’t take long before Soni stops these behaviors for good.